You’re cordially invited to join the Somerset-Pulaski County Chamber of Commerce for next Tuesday’s Business After Hours event at Lake Cumberland Regional Airport. 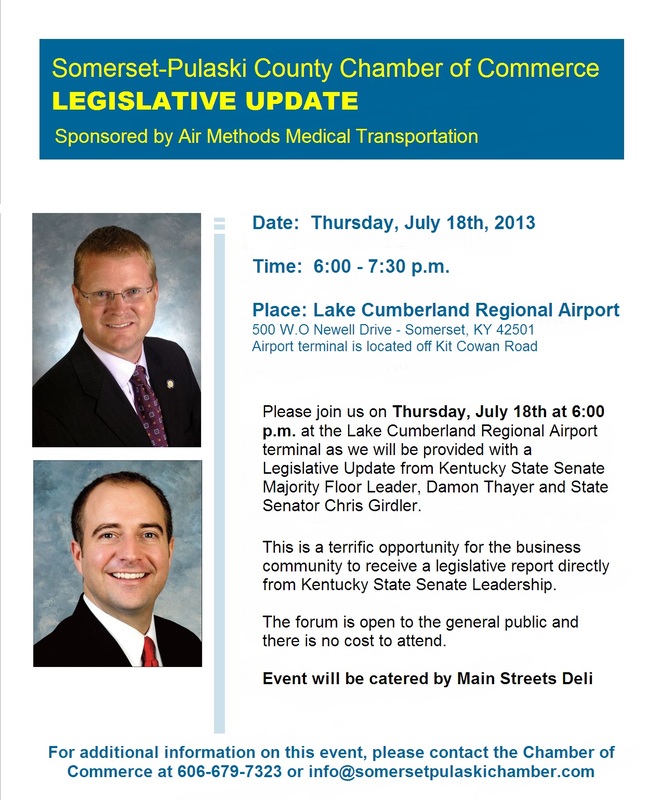 Please join us on Thursday, July 18th at 6:00 p.m. at the Lake Cumberland Regional Airport terminal as we will be provided with a Legislative Update from Kentucky State Senate Majority Floor Leader, Damon Thayer and State Senator Chris Girdler. This is a terrific opportunity for the business community to receive a legislative report directly from Kentucky State Senate Leadership. Air Methods Kentucky is a full-service air medical transport system based throughout Kentucky. Our aircraft are available 24/7/365, with overlapping service areas of coverage that help ensure a helicopter is readily available for your needs. Air Methods Kentucky provides the safe and rapid transports by helicopter of critically ill and injured patients. Whether it be the transfer of an ICU patient from one hospital to another or the complicated trauma request from an EMS provider, our competent crews continue to provide critical and life saving interventions surrounded by exceptional compassionate patient care. Air Methods Kentucky may be contacted by calling our 24/7 Communications Center at 1-800-678-9811.